How's the tour going with The Adolescents? MIKE: The tour's been amazing. It started July 16th in Denver at the BlueBird Theater, and from there, it stretched all the way to the east coast to Boston, which was amazing and sold out, and CGBGs in New York City, which was absolutely amazing. Another Boston punk band The Freeze played [in New York], which was a treat, and they ripped it up. From Boston, the tour stretched back to the midwest, with a crazy show in Chicago. We had an amazing show once we got to Seattle, and Portland was great after that. Now we're headed over to Bend, OR. The whole tour's been great, especially to play with such a legendary band. I hear Johnny got a black eye on the tour? MIKE: We were in Florida playing a show at this Irish pub. Johnny was signing on his mic. The place was packed to the gills with people, and they started to go crazy and come up on stage. He got hit with the microphone in his eye so that's how he got a black eye. Like a true soldier, he stood in there and played the whole show. It was pretty amazing to see a guy play a set with a black eye and stand his ground the whole time, not give in. What's next for you guys before you tour with the Bouncing Souls, because you have a bit of time in between tours? MIKE: This tour winds down August 20th so we have a month off before we have the Souls tour. We'll be doing a lot of interviews and a lot of press and promo for our new album Fading American Dream, which comes out October 10th. I think even a little prior to the Souls tour starting in October, we'll be doing some local stuff in Boston with promo. Do you have any CD release show planned for the Boston area? MIKE: We're tentatively looking at a few places for perhaps a listening or an acoustic set-up. We'll be talking more about that this week. I remember when we did Back To The World, we went to Dorchester and did an acoustic thing and listening thing. We're looking to do something like that. We'll be working on that this week and finalizing something down the line. How have the bands you've toured with so far influenced your live show and new material? MIKE: Touring with bands like Flogging Molly, Social Distortion, Tiger Army, The Briefs, Bad Religion, Brain Failure, The Adolescents, you walk away with things that are going to influence you, whether you are conscious or not directly conscious of it. Those bands all have great songs and have great live shows. You as a band take parts of that away, and it influences you. The biggest thing it does is give you hope and faith that you can do this for a living and give up yourself a 100% every night, play like every night is your last night, and give the performance of your life. All those bands have really inspired us, more than anything else, live. The bands that we have gone out with and toured with us have really inspired us. I remember, when we did the Bouncing Souls dates in the US last year on the West Coast and then Japan this year in March, their live performance was amazing, and they give so much of themselves during the show, and even before and after it, to their fans. That rubs off on you. You had mentioned the impact of music on your life. How did your life shift when you left the Dropkick Murphys to become a firefighter? MIKE: When I left DKM in 1998, I went to serve in the Boston Fire Department for four years. 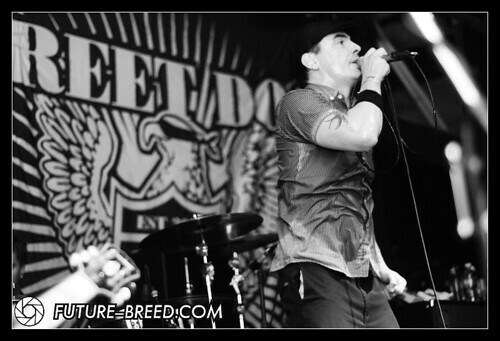 It wasn't until 2003 that Street Dogs started picking up momentum and touring non-stop, and I went on a leave of absence with the Boston Fire Department. Ever since 2003-2004, it's been non-stop for Street Dogs. Do you plan on continuing your career in the department later? MIKE: I don't know if I'm in the position to answer that because Street Dogs has so much planned and so much to do with live shows, record promotion, writing new songs, and things of that nature. I'll leave it open-ended and take it a day at a time and see where it brings me, but my commitment, focus, and efforts are 100% behind Street Dogs now. Street Dogs's name was based off of a song you guys wrote a long time back. Will we ever get to hear that song? MIKE: It's a song that died. When the band first started, it was an informal, casual thing for fun and jamming and song ideas. We did a demo just for kicks that picked up a lot of attention, got inundated with phone calls, and then we dropped the Savin Hill record and went on the tour.... How did I get from \"Street Dogs\" to all that? *laugh* Going back, when we first started jamming informally, that song came up. We didn't have a name or anything, and we were perplexed, needing to name it and everything. I liked how it sounded, and we went with that. It's not the worst band name, and it's not the best. We stick by it. What can we expect from your new album that's coming out in October? MIKE: I think people can expect thirteen honesty, hard-hitting songs. The release is a complete band effort, and everybody had influence and a say. We had produce the record, and during pre-production and tracking, he wouldn't settle for any second-best or half-assed performance, he pushed us and pushed us. We had so many songs that we came into pre-production with that just didn't muster. Ted challenged us to come up with better stuff. I think the ending result is that we did come up with those thirteen best. That's what people can expect. It's a incendiary mix of both disaffection, anger, honesty, and just wearing it on our sleeve without a moment of hesitation. What's your favorite song to play live, either old or new? MIKE: I'd have to say Back To The World is my favorite song to play live. In a close, close second place would be Fighter. Back To The World touched a lot of people, touched a lot of soldiers--men and women of the armed forces. I feel like when we play it live, it strikes a chord with whatever audience, be it America, Europe, or beyond. It's a powerful song, a pro-human being song, a pro-human condition song, and certainly not a pro-war song. War is inherently horrible, cruel, and doesn't leave anything taken care of. Back To The World recognizes that the men and women of the armed services are away, in harms way, away from their loved ones, and they are human beings. We all know your city, Boston, is a hotbed for new music. What are some bands that you want people to check out? MIKE: I think Darkbuster are amazing, be it on record or live. Ramallah is amazing. The Explosion are really good. Lost City Angels are amazing. The Fug Uglies are another great band. There was a band, The Three Sheets, that were pretty good. The Ducky Boys are back at it and better than ever. It's like you said, there's always a flurry of activity and bands active in Boston. I could go on and on and on. The movement is vibrant. Those are some of the bands that catch my attention. Boston also has a huge legacy of legendary bands. When the Street Dogs have finally come to a close, what do you want the kids of Boston and beyond to remember of the Dogs? MIKE: Just that it was an honest, hard-working, unbelievable live act. The studio recordings and live acts were quality and exceptional. We gave 100% of ourselves at all time. That's how I'd like it to go down. Whether it goes down like that is another story. People judge you from their own auspices and opinions. I feel right and down the road, we will be considered a band that shows up at venues and shakes the foundations to the high hells and give it all we had to make an impact. That's all we've wanted, to make an impact, to let out ourselves and what's inside ourselves, sing music about it, travel the world, spread it. We're grateful to have the opportunity to do that, and we never lose sight of that. There's been a lot of separation in the scene today genre-wise and exclusive-wise compared to the past. What's your opinion on the condition of the music scene today? MIKE: In a perfect world, people would be open-minded and not so exclusive; they wouldn't be so segregated, and genres wouldn't be so rigidly defined. I think a lot of that has to do with the press and horrible music television channels. Things of that nature pigeon-hole things, label things, and make things commodities. Kids these days grow up, don't know better, and fall into these labels and categories. Music inherently, since it's origin, is bigger than that. There's so much music, from long ago to listen to. You don't need to listen to MTV and the radio and listen to what they jam down your throats. Go to a small record store and find that album that nobody's really listened to. Buy something different; buy something unique. Listen to something different, like a dub record, jazz record, old musical records. Don't be force-fed. That would be my suggestion to anyone. Be your own leader; be your own person. One thing that's evident in the underground punk scene is that bands are so involved in causes that are bigger than themselves, whether they are specific organizations or ideals. What do you or Street Dogs push for? MIKE: Because I've always advocated for it, worker's rights and the ability for workers to organize and have the ability to say yes or no in a work place. That's something we've always felt passionately about. Always felt passionately about Amnesty International, The Red Cross, things like that. From where we sit, human rights, giving oneself for helping others who have been hit by tragedy or famine, is a big thing. I would leave it right there; I don't fashion myself to be an expert, and I try to be open-minded and objective in my life. I don't want to be too opinionated and rigid, because every day is a learning experience. The things I listed previously are ones we feel passionately about and would advocate. At the same time, we're not claiming to be experts or self-righteous by any means. Some bands, to some degree, get a bit too self-righteous and condescending. We don't want to be like that at all. Any last comments to the readers? MIKE: If you want to check us out, we have a Myspace page with some tour dates and MP3s. We have a website as well. We're going to be around, releasing a new record, Fading American Dream, October 10th. We're on tour with the Bouncing Souls, and the dates are up on their Myspace, our Myspace, our site. If people want to check us out, give it a shot, and come to the show. The bands on the bill will give their 100%, and you won't be disappointed at all.